MB Holding Group has introduced Sharifa Al Harthy HR Award of Excellence;that is granted to winner of the newly launched HR Standards of Excellence scheme. TheStandardswill form a benchmark for HRFunctional Excellence within MB Group.Dedicating this Award to the Vice Chairpersonhas come in recognition ofher significantcontributions to HR profession and the business community in general. In addition, this award is an appreciation of her long served career as the Head of HR for MB Group, as well as her continuous support to HR fraternity within the Group and beyond.Badran Al Hinai, the Group HR Manager has stated “HR Standards of Excellence scheme will play a major role inpeople management in the business.We are immensely honored as a profession that Mrs. Sharifa Al Harthy has accepted to sponsor the HR Award of Excellence”. This scheme will be used for various HR audits and benchmarksto support the goal of standardization and the 1-HR concept locally & globally. Moreover,the scheme encourages different stakeholders to adopt best HR practices and elevates the overall functional professionalism and excellence in the MB Group. Each MB Group company HR has been evaluated against the MB HR Excellence standards. It is not a competition between companies, but a benchmark against the standards. First step in the process was to carry out self-assessment by HR departments, followed by business verification by business leaders.Final evaluation and verification weredone initially by the Internal Audit department with independent HR representation, followed by independent senior management panel. The recognition ceremony was held on 18thof September during the HR Town hall meeting.Petrogas E&P LLC HR team was the best performing MB Group Company against the standards in 2017 followed by the runner up MBPS Well Services department and MBPS Production Services department in the third place. The proud winner, Petrogas E&P LLC HR team,received their trophy from Mrs.Sharifa Al Harthy in a ceremony attended by theGroup HR managers and professionals. On the 31st of October, in Abu Dhabi, Petrogas E&P of MB Group was recognized by ‘GCC GOV HR Awards’ for its efforts in Human Resources & People performance. Petrogas won an award for ‘Best Nationalization initiative in the private sector`. The organization was selected from amongst some of the best & most prestigious companies operating in the GCC. The ‘GCC GOV Awards’ Aims to recognize, promote & reward professionalism and outstanding achievements of governments, business organizations, and people who have raised the bench mark of people performance across the region. 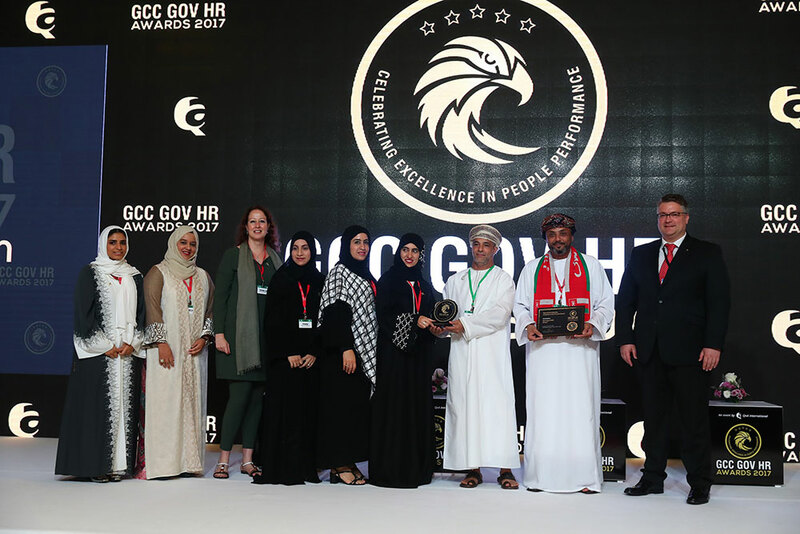 The Petrogas HR team members are humbled and honored that their efforts have been recognized and are further motivated to continue to work toward people performance and development of young Omanis. Yasser Al Mughairi, Chief Human Resources Officer stated, " winning an award in the category of Nationalization is a testament to His Majesty Sultan Qaboos bin Said Al Said, vision & personal dedication to empowering the Omani people. Today, Petrogas E&P and MB Group of companies have tirelessly worked towards His Majesty`s vision in employing, training and empowering the Omani work force. Petrogas E&P was also nominated for “Innovation in employee engagements in the private sector." Although, there was high competition in this category, Petrogas E&P managed to be shortlisted by GCC GOV HR panel. In Petrogas and MB Group companies, we believe in Omanization and the operational, economic and social value it brings. Our future plans embed stretched targets for empowering and developing Omanis, supporting ICV and fostering Oman’s economy. As part of it’s plan to grow its resource base in North West Europe, Petrogas has signed a Sales Purchase Agreement (SPA) with PA Resources AB to acquire some of its subsidiaries holding a number of exploration and potential developmental interests in Denmark, The Netherlands, UK and Germany. The transaction is subject to fulfillment of a number of conditions including regulatory approvals, and is expected to close during the first quarter of 2016. Petrogas E&P, the Exploration & Production arm of MB Holding Group of Companies recently received two international certifications - the ISO 14001:2004 - Environment Management System and the OHSAS 18001:2007 Occupational Health and Safety Management System. The company is now internationally recognized for its high level of standards in Environment Management Systems and HSE in alignment to ISO 14001:2004 & OHSAS 18001:2007 and monitored with strict parameters that are used globally. As one of the leading Exploration & Production companies in the Sultanate, Petrogas conducted comprehensive audits that covered every aspect of its business in the Muscat Head Office as well as field operations in Rima to pursue these certifications. Some benefits of these certifications include awareness and protection of the environment, reduction of accidents and incidences, staying abreast of relevant legislations and reduce the likelihood of prosecution and fines, standardization of HSE management systems keeping in mind international procedures and rules. Established in 1999, Petrogas E&P is the holding company for MB Group’s Exploration and Production (E&P) assets in Oman, Egypt and The Netherlands. Petrogas E&P subsidiaries are engaged in the full range of Oil & Gas activities from exploration through appraisal, development and production. In 2014, Petrogas purchased all the outstanding sharesof Chevron Exploration and Production Netherlands B.V. (CEPN), including its subsidiary Chevron Transportation B.V. (CT). The Dutch assets A/B and P/Q are now held under Petrogas Exploration and Production Netherlands. The purchase includes operating working interests in 11 blocks in the Dutch sector of the North Sea. This includes seven blocks, with working interests ranging from 23.5% to 34.1%, which make up the A/B Gas Project. Also included are working interests ranging from 46.7% to 80% in three blocks that contain other producing fields and a 100% working interest in the P2 exploration block. PEPN currently employs 189 personnel including 127 employees and 62 regular contractors in offshore and onshore positions in the Netherlands. PEPN owns and operates interests in the A and B Blocks (including the recently acquired A15 and B17 licences). In 2005, the company and its partners were granted production licenses enabling the development of the A/B shallow gas fields in the Dutch North Sea. A central processing platform and an export pipeline were installed in Block A12 in 2007. First gas was achieved in December 2007. Since then the B13 (unmanned) production platformhas been commissioned and brought online in December 2011. 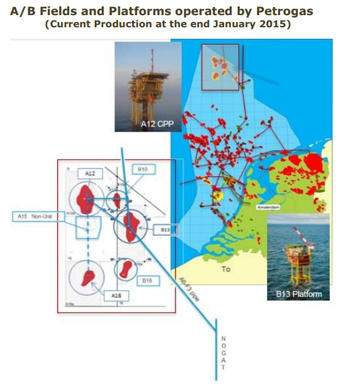 PEPN also operates and owns the P/Q Oil Area with existing production from five fields viz: Q1 Block (including the Helm, Helder, Hoorn and Haven fields), the P9 Horizon field (straddling P9a and P9c), the Halfweg field (straddling Q1 and Q2c) and the P02 exploration block. PEPN has been active in the Netherlands since the mid-1960s and producing Oil since 1982 (then operated by Unocal). First production from the Helm and Helder platforms in block Q1 took place that year. This was celebrated in 2012, marking a significant milestone as 30 years of offshore oil production. Currently there are 6 platforms in the P/Q fields operated by Petrogas. In 2014, total average daily production was in the tuneof 2,400 barrels of crude oil (net ~1950 bopd) and about 117 million cubic feet of natural gas (net ~40 mmscfd). The barrel oil equivalent daily production net to the company was in the tune of 8,800 boepd.